Tidal Stream is the name given to the horizontal flow of water through the oceans caused by the continuous ebb and flood of the tide, which as we know is the vertical up-down movement of the oceans water. Unlike water currents which are a continuous, unidirectional and form a steady horizontal movement of water flowing down a river or stream etc, a tidal stream or tidal current, changes its speed, direction and horizontal movement regularly according to the forces of the tide controlling it. Tidal stream generation is a non-barrage tidal scheme, unlike tidal fence energy which uses a physical barrier to extract the energy. Tidal stream systems extract the kinetic energy (energy in motion) from moving water generated by the tides without altering the environment thereby making it a hydrokinetic energy system. At or near the coast, the ebb and flood of the tides causes the oceans waters to pile up resulting in a high tide along the beach, with some of this water being forced into tidal inlets, basins and estuaries while the majority is forced sideways along the shore. This movement of the tidal range amplified by geographical features along the coastline, focuses these tidal currents into a single predictable and concentrated form of renewable energy which we can exploit using a tidal stream generator. A tidal stream is usually stronger nearer to the coast where the sea water is naturally shallower causing the water to speed, than it is farther out in deeper depths. Tidal Stream Generation is very similar in many ways to the principles of wind power generation. Horizontal turbine generators called “tidal turbines” or “marine current turbines” are placed on the ocean floor, the stream currents flow across the turbine blades powering a generator much like how wind turns the blades of wind power turbines. In fact, in some tidal stream generation areas the sea bed looks just like underwater wind farm with arrays of tidal stream generators covering large areas. The generated tidal electricity is then transmitted to the shore via long underwater electrical cables called submarine cables. These offshore tidal turbines can be either partially or fully submerged beneath the surface of the water, with partially submerged turbines being easier and less costly for maintenance. While tidal stream installations reduce some of the environmental effects of large man-made tidal barrages, major ocean currents like the Gulf Stream, travel at speeds significantly slower than the wind. 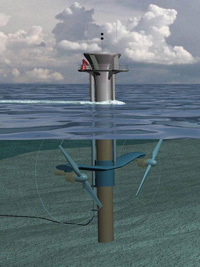 However, as water is 784 times more dense than air (which is why we can see water and not air), a single tidal generator sitting on the sea bed can provide a significant amount of ocean current energy at low tidal stream velocities which is far superior to wind, using similar or identical turbine technology. Since energy output varies with the density of the medium, ( Kg/cm3 ) and the cube of the velocity, ( m3/s ), we can see that a 10 mph (about 8.6 knots in nautical terms) ocean tidal current would have an energy output equal or greater than a 90 mph wind speed for the same size of turbine system. Therefore, even small increases in velocity can lead to substantial changes in the amount of available power and therefore, smaller faster rotating tidal turbine generators can be used in a ocean based tidal stream system. As the kinetic energy content of a tidal stream flows per unit time, which is the same as the hydro power ( P ), the available energy can be calculated in terms of velocity ( V ), swept cross-sectional area ( A ) perpendicular to the stream flow direction, and the density of the water ( ρ ), which for sea water is approximately 1025 kg/m3. Providing the velocity is uniform across the cross-sectional area, at any instant in the tidal cycle the amount of energy available will be: P = ½ ρ A.V3. This cubic relationship between velocity and power is the same as that for the power curves relating to wind turbines, but there are practical limits to the amount of power that can be extracted from tidal streams. Some of these limits relate to the design of the tidal stream turbines and the characteristics of the underwater resource. Unlike off-shore wind power which can suffer from storm or heavy sea damage, tidal or marine current turbines operate just below the sea surface or are permanently fixed to the sea bed. Most submerged tidal turbines essentially operate in the same way as a wind turbine and are fastened to the ocean floor, with water pushing the turbine instead of the wind. These turbines have an axis of rotation horizontal to the ground and operates like a traditional windmill consisting of a rotor, a gearbox, and an electrical generator. These three parts are mounted onto a steel support structure with the three main types of support being a gravity structure, a sunken piled structure or a tripod structure as shown. For a sunken pile support, a single steel pile is driven deep into the sea bed with the tidal stream generator assembly attached to it. This tubular support is less stiff than other types and can flex under the downstream drag forces of the tidal waters when used in shallow waters. A gravity support generally uses a large heavy concrete block or blocks which sit on the sea bed. Due to the heavy weight of the concrete block, the structure is stiffer and therefore more resistant to flexing. A tripod or truss support uses a tubular frame with a much larger footprint positioned on the ocean floor to support the generator assembly. This type of system is used in oil and gas exploration so is a known technology. Other tidal stream generator designs fixed to the ocean floor include: Reciprocating Tidal Stream Devices that uses a large hydrofoil similar to a whales flipper, which moves up and down parallel to the direction of the tidal stream instead of rotating blades, and Venturi Effect Tidal Stream Devices, were the tidal turbines are located inside a cylindrical duct, much like a fan housing. The tidal flow is funnelled through this duct, which concentrates the flow producing a pressure difference causing a secondary water flow through the reaction turbine thereby improving efficiency. Also, there are several practical advantages in placing the tidal turbine inside a fan type duct, such as less dangers from the rotating blades to both aquatic marine life and divers as a safety grill or cover could be placed on the upstream opening which would also have the secondary advantage of preventing floating debris from being drawn or sucked into the turbine causing damage. The duct itself can provide shading and/or shelter for the reaction turbine from direct sunlight, preventing seaweed, algae growth or crustaceans forming on the blades and mechanism as they do on the underside of boats. We know that tidal streams are formed by the fast flowing horizontal currents of water caused by the ebb and flow of the tides with the profile of the sea bed causing the water currents to speed up, or slow down near the shoreline. Then tidal stream turbines can generate power on both the ebb and flow of the tide. One of the disadvantages of Tidal Stream Generation is that, as the turbines are submerged under the surface of the water they can create hazards to large sea mammals, navigation and shipping. Given the technical difficulties resulting from underwater corrosion, increased maintenance issues, weed growth on the blades, which could reduce their efficiency and stability concerns, other forms of alternative tidal stream generator designs are now being used. These include the tidal turbine being connected to a floating barge or ship on the waters surface, essentially operating as an upside down horizontal turbine instead of fastening the turbines directly to the ocean floor. There are numerous advantages to this type of tidal stream generator design, including easy maintenance and accessibility of the turbines, by simply removing or replacing them out of the water, and no costly steel supports or alterations to the ocean floor. Also, as the tidal turbines are located under a barge, pontoon or fixed directly to the hull of a ship, they can have their electrical connections and equipment mounted safely above and out of the water. Plus the supporting flotation device can be easily moved to stronger tidal stream areas if required, but they are limited by distance due to their umbilical electrical cable connected to the shoreline. Tidal Turbines or Water Current Turbines, operate in a manner very similar to a wind turbine and can generate electrical power from strong horizontal tidal currents called Tidal Streams with very little environmental impact. These tidal currents drive the propellers of tidal stream generators, with the blades automatically adjusting towards the prevailing current but convert only a fraction of the kinetic energy of the tidal currents into electrical energy and send it back to shore through a submarine cable. Being located underwater, tidal turbine generators produce no emissions or noise and their environmental impact is much less than that of a tidal barrage. In the next tutorial about Tidal Energy, we will examine another alternative way of using tidal turbines and tidal streams to generate electricity by using an underwater Tidal Fence. For more information about “Tidal Streams” and how to generate your own electricity using the power of the sea, or obtain more tidal energy information about the various tidal energy systems available, or to explore the advantages and disadvantages of tidal power, then Click here to order your copy from Amazon today about ocean, tidal and wave energy, the energy revolution from the sea. I have toured over 30 global sites of commercially-available tidal, wave, ocean currents, and free flow kinetic river devices. We are in a material science renaisance, which is why we can now have off-shore wind turbines and marine energy devices that can last for 25 years in the water, which is salty, acidic, and has sea life that can pit and add corrosive compounds. That said, pollution free, 24-hour electricity that does not harm sea life or marine ecology, recreation or boating have immense positive implications for our planet. I would like to add a new generation renewable energy power plant that harness water 24/7 “the Vortex Power Plant”. I would be very interested in a tidal generator system for our home. We live on a salt water channel in Washington state USA that usually runs at 7 knots in both directions. Any help you can give us would be greatly appreciated. I am excited for the future large scale use of these. Wind is not a wise choice,with visibility/noise/cost, etc being negatives. Much success with Tidal !! !